I'm totally procrastinating working on my report cards, so I thought a new blog post would be in order. 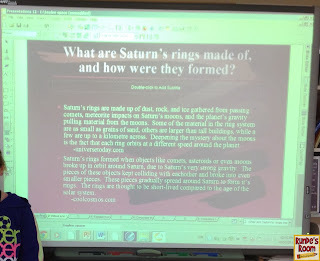 Here is a peek into last week in my classroom. 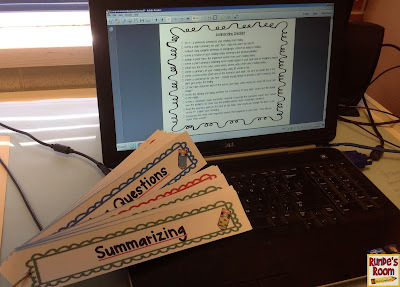 We're working on summarizing as our comprehension strategy right now. We've added it on our CRAFT board and written about it in our CRAFT books and reader response books. Next week we are going to start our new literature circles, so we've been practising this strategy orally through the week. When my students have finished their daily independent reading (about 20 minutes a day), they get together with a partner for a "pair share". During this pair share, they each read a page from their books, and then ask their partners some questions related to our current reading strategy. To aid with this, I use my Comprehension Question Fans. One or two groups will get the printed out fans on the ring to use, and for the rest, I project the checklist sheet over the computer onto the smartboard so everybody has access. They must pick at least 2 questions, and the partners can't choose the same question. After about 5 - 10 minutes, students come back to their desks and I choose 4 volunteers to share with the class. They must share a summary of what their partner read to them, and then share how their partners answered the questions they asked. A quick and easy daily formative assessment for oral language. 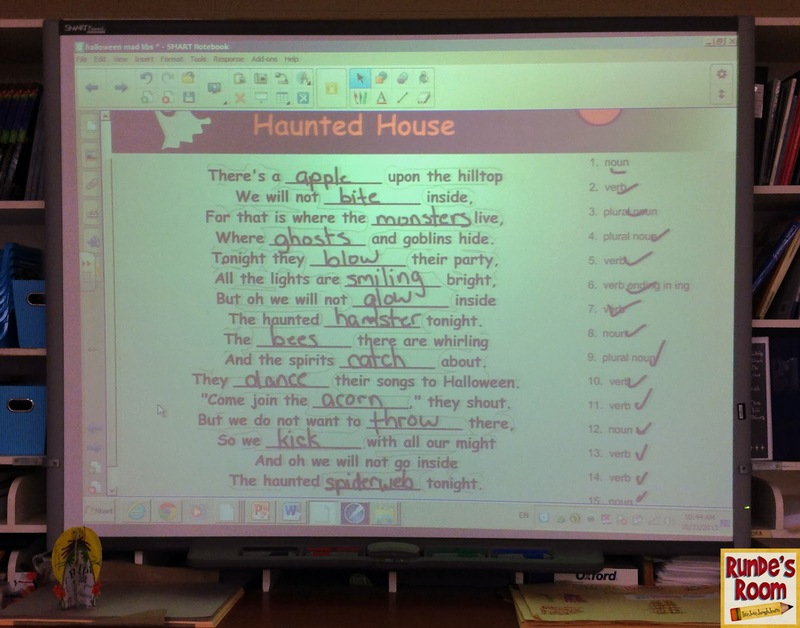 In writing we're working on our fictional narratives beginning from a Halloween prompt. We've been using the story map planning sheet from my new Story Elements Concept Posters. 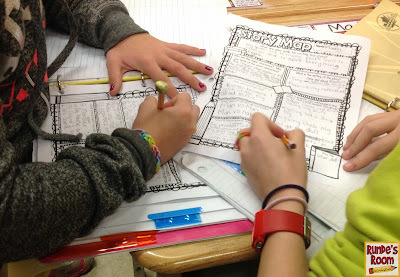 When students had finished their planning graphic organizers, they met with a partner to share. After they read through what they had, partners had to give them "a wish and a star". Following this, they had to make revisions to their planning sheet based on the feedback from their partner. They LOVE sharing their work with their peers in the class, and it's so beneficial for both students. 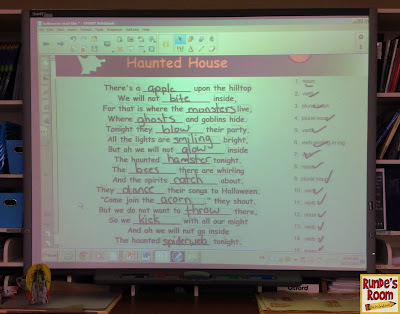 Students are almost finished with their rough drafts right now, and after some guided editing and revising lessons planned for this week, we'll be publishing them for our writing wall. Wednesday was our big science day. 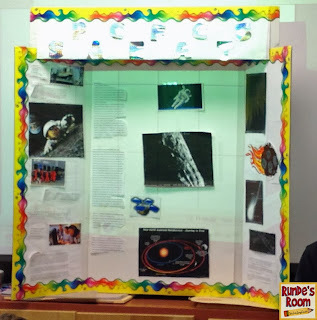 Students had been working on their independent inquiry projects for Space for about a week and a half, and Wednesday was presentation day. They had to present their findings through a physical project and an oral presentation. They did such a great job! 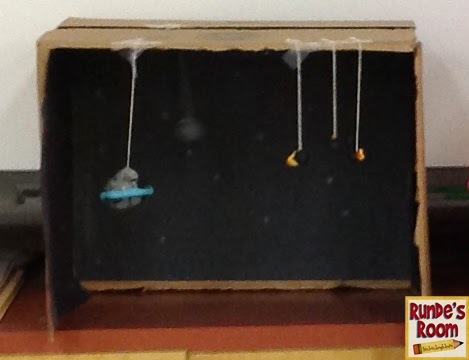 We had poster boards, science fair boards, slideshows, movies, powerpoints, and plasticine dioramas. 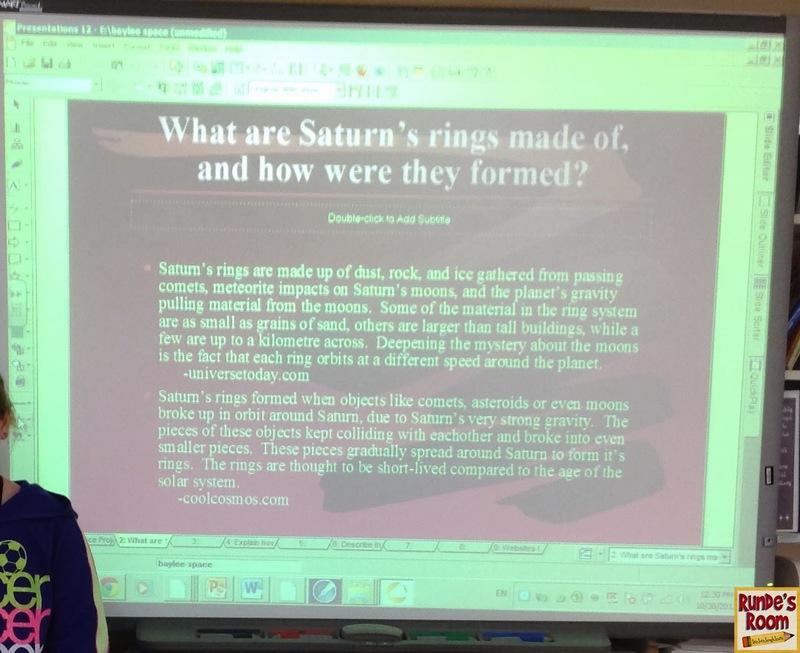 Here are a few pics - I took a picture of each student presenting so I could send home a pic with the rubric. On Thursday, I kept the students busy in the morning with our Halloween mad libs (at their request). When they were finished I had them complete a comprehension exit slip (give an example of a noun, verb, adjective, and adverb) and post it on our traffic light exit slip board (red circle for some difficulties, yellow circle for a few questions, and green circle for good understanding). Accountability - love it! Yesterday I combatted (well, tried at least) the sugar highs with a data management activity. 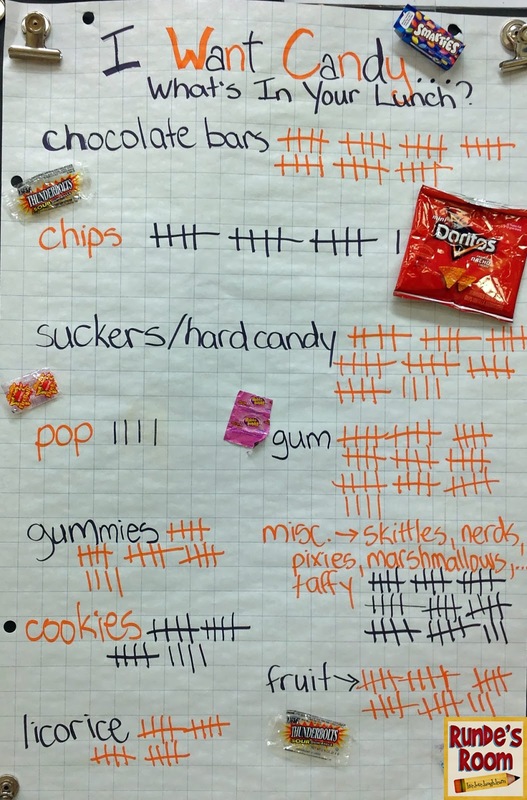 We finished up our patterning unit this week, so for our data management diagnostic I asked the students how many (and what kinds of) candies they had in their lunch bags that day. 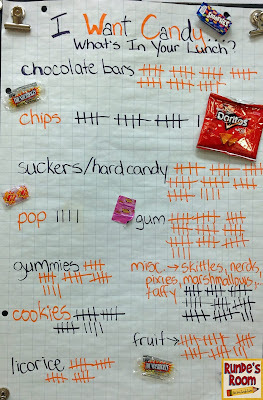 We made a tally chart with the results. 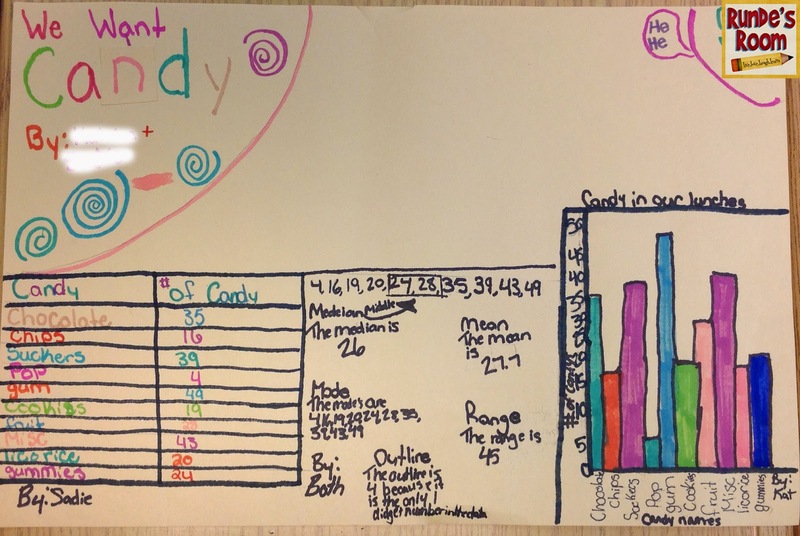 Students then had to take the data we compiled and represent it in two different ways (their choice). 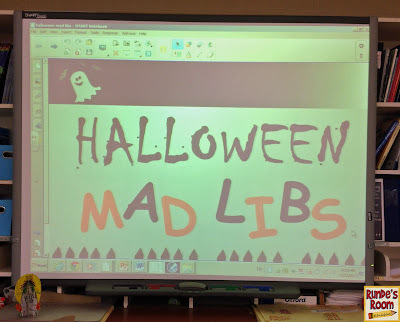 I was more than a little horrified to find out that my 24 students present that day had a total of 277 pieces of candy in their lunches ... thank goodness we had a presentation for the last block of the day that kept the students engaged ... and the teachers sane. Last weekend I added a new resource to my TPT store - a poppy craftivity we'll be working on for our Remembrance Day assembly. There are two versions in the resource - one with general questions about veterans and the day, and another that has students studying and answering questions about the poem, "In Flanders Fields" (that's the version we'll be doing in the class). You can click HERE or on the picture to the right to take a peek at it. So, there it is ... a peek at last week. I have successfully procrastinated for a bit now, so I guess it's time to tackle those report cards. Sigh. Happy Weekend!!! Hi Jen, I'm procrastinating working on report cards too by reading blogs! Love your ideas from last week. 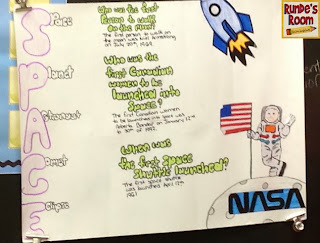 We just finished a huge unit on Populations and Ecosystems in science and I was thinking of setting up an inquiry project like the one you described with your space unit above. 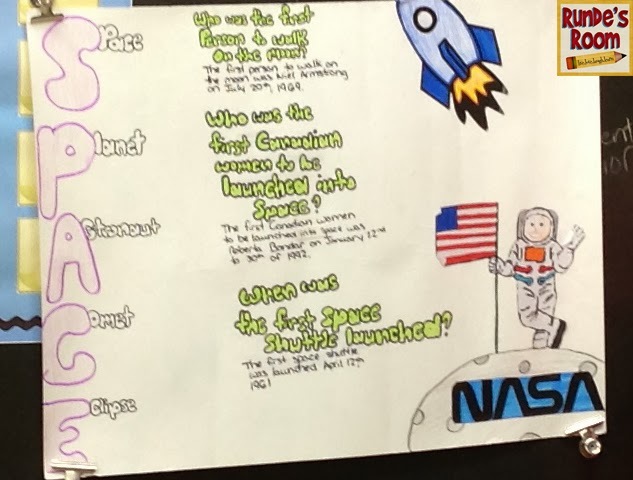 I've never done this before, where the kids come up with their own inquiry topic and then presentation, any suggestions you have would be welcome! Hoping your reports go well! We've already handed ours out and have conferences this week. Can't wait for this week to be over! Hi. I've been reading your blog since the beginning of the school year and I just want to say I thoroughly enjoy it and love getting ideas from you. Thank you for sharing! Enjoy your week. Blog hoppin' and stumbled on yours. Great ideas, I just added you to my favs board. 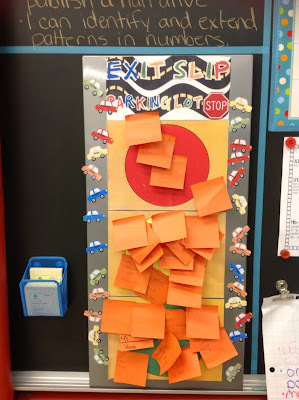 I love the exit slip idea! I teach science to 385 K-5th graders and I only see them for one hour a week. This is a great idea for letting me see what I should start with the next week! I have seen other ways, but love this one best!